I’m comfortable driving just about anywhere in Europe. But Italy’s Amalfi Coast is where I draw the line. Big buses, little minivans, scooters, and pedestrians all simultaneously stake their claim on a two-lane road, often taking far more than their share out of the middle. Side-view mirrors brush within milimeters of each other, honking horns and furiously gesticulating arms assert right-of-way, and pedestrians scurry for their lives along tiny shoulders. I joined a minibus tour and let a local expert to do the driving, sparing myself some stress — and, most likely, accidents. Sitting in the back seat of the minibus, the passing traffic was fascinating rather than terrifying. I periodically locked eyes with confident bus drivers, reckless motorino pilots, and terrified tourists wishing they’d passed on the rental car. While someone else negotiates the hairpin turns, I get to focus on the jaw-dropping scenery. 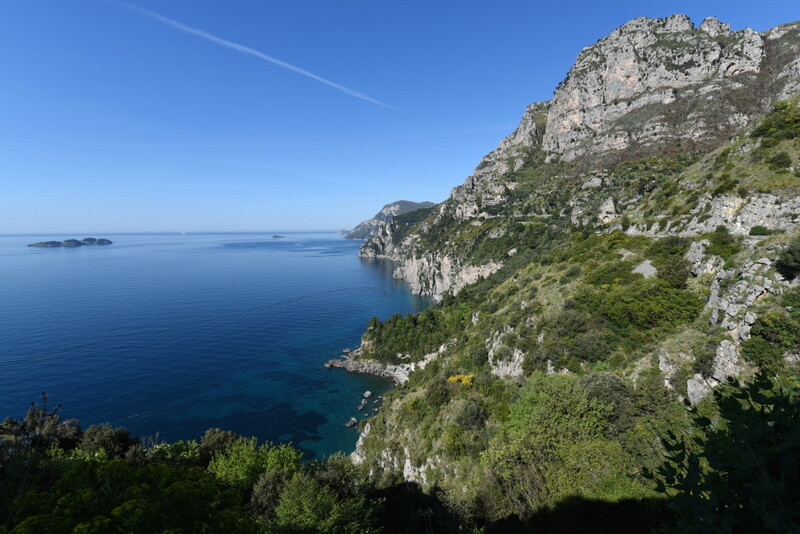 Jagged limestone peaks plunge directly into the deep blue and green waters of the Bay of Salerno. Somehow people have figured out a way to settle this mountain-slashed terrain — filling every available gully with a cantilevered gaggle of colorful houses. Mixed in are the villas of the rich and famous, who have been drawn here since ancient Roman times. It seems that every hotel we pass is named Bellevue, Belvedere, or Bellavista. And the views are beautiful indeed. 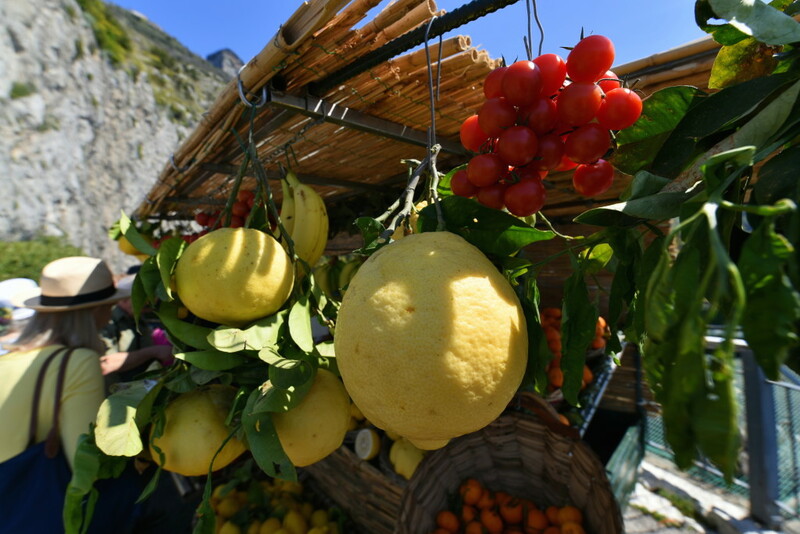 In the Amalfi Coast equivalent of a lemonade stand, entrepreneurial locals set up shop at each wide shoulder, selling products made from the local specialty, handpicked lemons. At one particularly scenic spot, just past Positano, a weathered old man stood next to his rickety cart piled high with fresh citrus. The local authorities let him set up shop here, and in return, he keeps this stretch of road litter-free. Popping fruits in and out of his hand-cranked press, he squeezed me a blend of orange, lemon, and clementine juice…delicious. 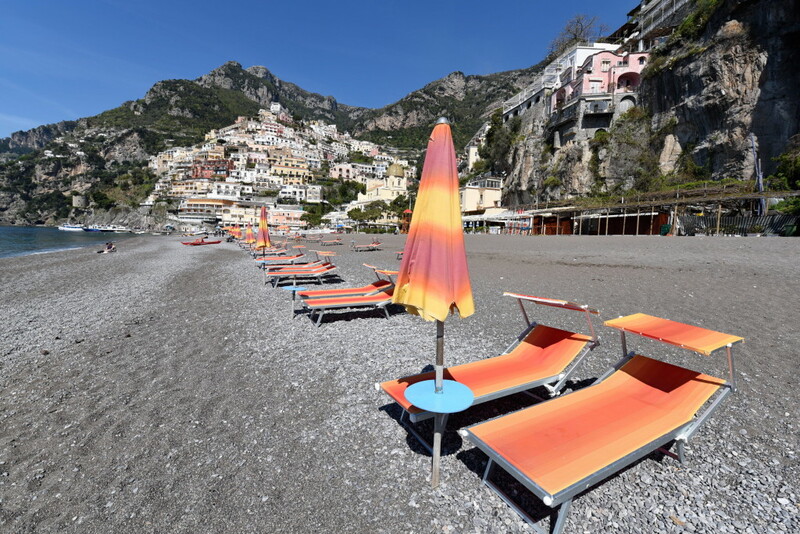 Positano is draped over a series of terraces that stairstep down to the sea. Like a natural amphitheater, the town faces its majolica-tiled church dome and its pebbly beach. And even though it’s only April, people are already catching some sun. 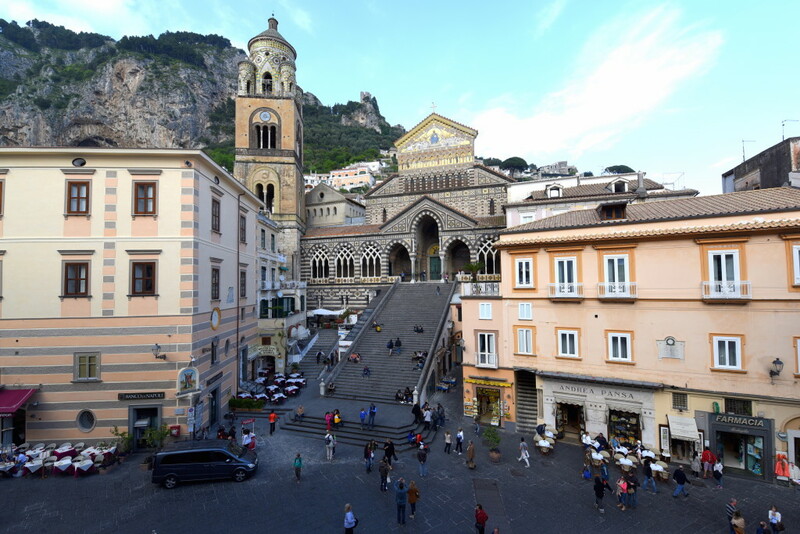 Amalfi, the coastline’s namesake, was a big deal a thousand years ago. Along with Venice, Pisa, and Genoa, it was one of Italy’s Maritime Republics — independent, business-minded city-states that were more powerful (and more wealthy) than many entire kingdoms. 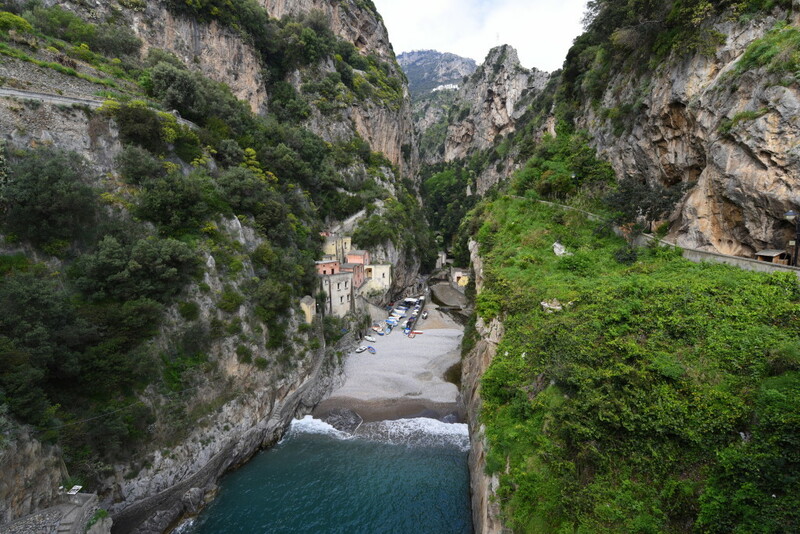 But a tsunami wiped out Amalfi in 1343, and it became a forgotten backwater. Strolling Amalfi today, it feels the most like a real, living city of anyplace along the Amalfi Coast. The main square is one of those wonderful piazzas that has great feng shui — it encourages lingering. A long staircase (sort of a mini-Spanish Steps) leads up to the front door of a thousand-year-old cathedral. Those stairs are the town’s meeting point — a picturesque and convivial suntrap. High above it all, minuscule Ravello is the Amalfi Coast’s version of a hill town. 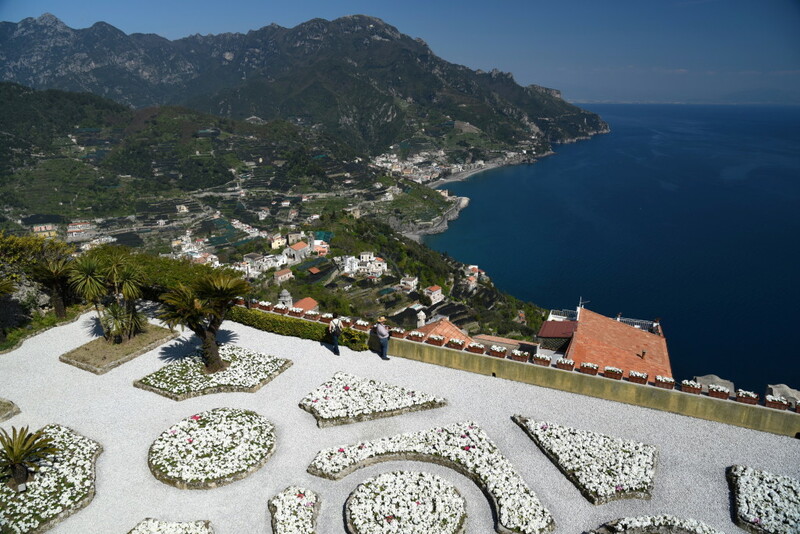 It clings to a cliff so steep that the adjacent town (across a big gorge) is named “Scala” — literally, “Stairs.” Understandably, Ravello is prime territory for grand villas, and two of them — each with sprawling seaview gardens — bookend the lazy, nearly traffic-free town center. And yet, for all its glamor, Ravello’s core feels pleasantly low-key, even humble. Teens hang out on the church steps, while across the square, a row of perfectly positioned umbrella pines thoughtfully provide a canopy of shade for the bellavista benches. All in all, driving along the Amalfi Coast — with someone else behind the wheel — is a day very well spent. I’m a week into my South Italy trip. It’s been hot and sunny, and the colors are absolutely popping. Here are some of my favorite photos so far. 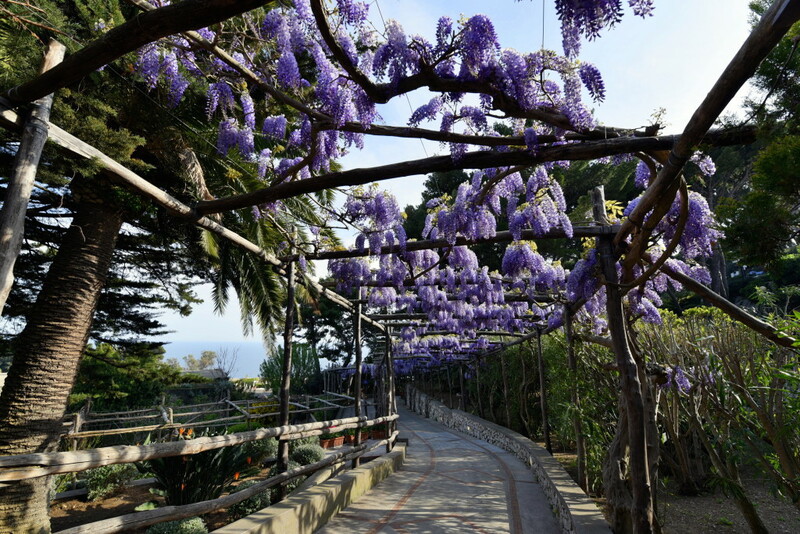 The wisteria is out, and nobody knows how to make the most of it like Amalfi Coast gardeners. This is on the Isle of Capri. Italians have mastered the art of living. 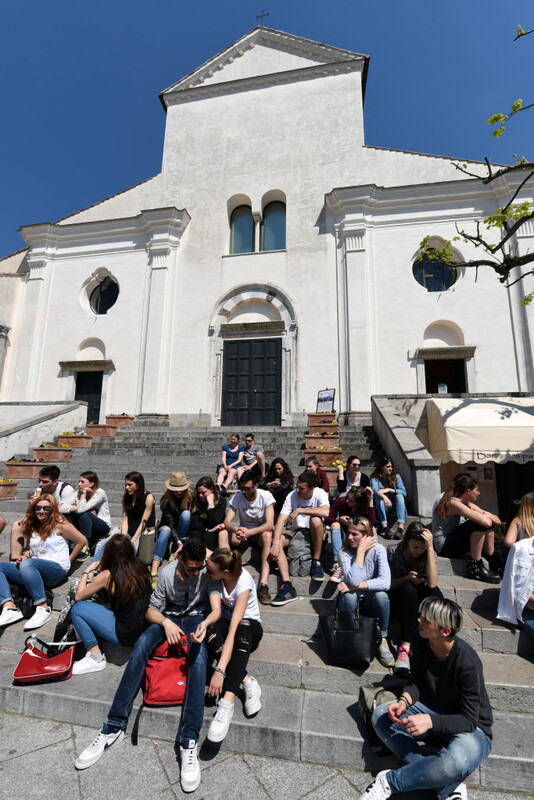 And for Italian teens, that means being the best in the world at simply hanging out on the church steps. 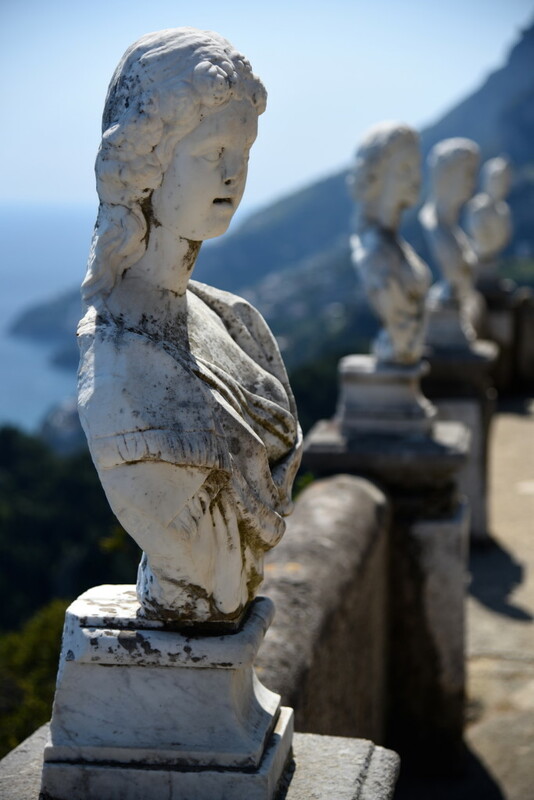 This seems like some sort of torture right out of classical mythology: Statutes forced to stand for eternity, staring away from glorious Amalfi Coast scenery. You see a lot of stray cats around Italy. But most are mangy mutts. (Don’t get me wrong…I have two mangy mutts myself.) 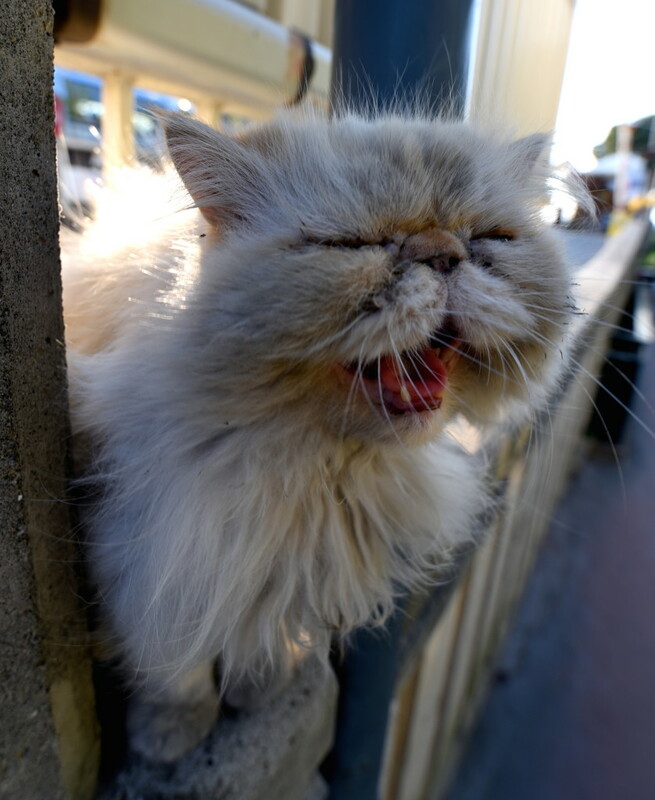 This adorable puss, in Sorrento, seems to be a designer cat who’s struck off on her own. 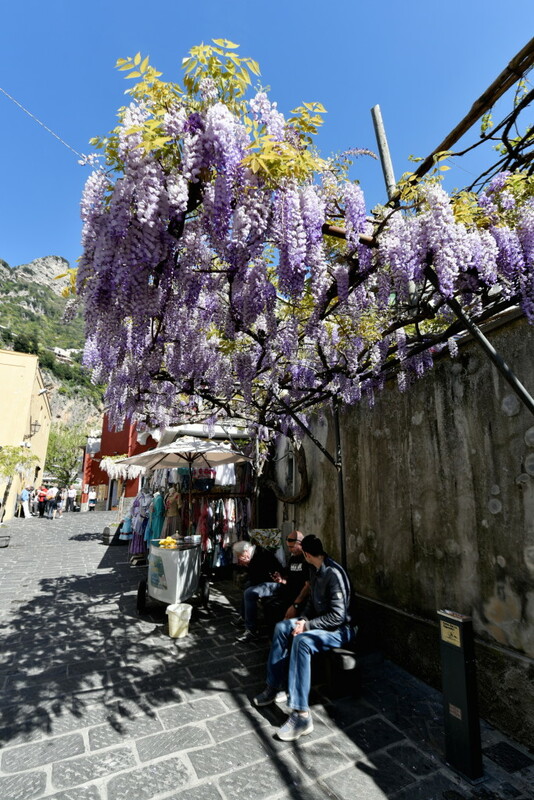 Yep, more wisteria…this time in Positano. The stuff is everywhere. 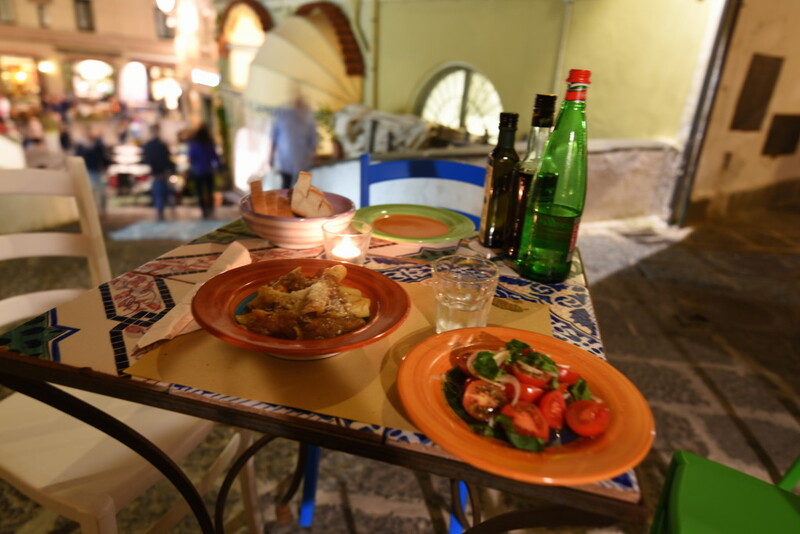 The last two nights, I’ve had starkly different dinners in the town of Amalfi. Each one cost about €25. One of them I’ll remember for years. The other I’d already forgotten while I was still eating it. Travelers have choices, and the best options are rarely the easiest ones. And this is never so true as when you’re restaurant-hunting. After a few days in Italy, I feel like I’ve seen the same menu dozens of times. Pasta with clams. Seafood risotto. Lasagna. Spaghetti Bolognese. Because this is the Amalfi Coast, they often throw some lemon in there somewhere. Only the restaurant’s name changes. Last night, moments after arriving in town, I went looking for restaurants. On a relaxed little neighborhood piazza just a few steps from the main drag, I zeroed in on a promising-looking place. I grabbed a table, ordered a pasta, salad, and dessert, and — while the food was pretty good — the experience barely made an impact. Tonight I got more ambitious. I had asked a local guide, who leads food tours in a neighboring town, where she eats when she’s in Amalfi. Her answer: Taverna degli Apostoli, tucked around the side of the cathedral’s grand staircase. And sure enough, it was the best meal of the trip so far. Here’s the play-by-play. Service: Last night, I sat outside, a few feet from where the owner was trying to drum up business. His running banter with random passersby was comically desperate. “Hey! Where you from? You want a good meal? Very cheap ’cause we’re not on the main square. Come on! I promise you like it!” Entertaining as it was to watch him set his hook in a family of four from Vancouver, then expertly reel them inside, it distracted — and detracted — from my dining experience. Tonight at Apostoli, my soundtrack was mellow jazz rather than aggressive sales pitches, and the service was astute and warm. When I asked if the broccolini was particularly bitter, she gracefully acknowledged it was, and nudged me toward something else. When the table in front of me opened up, she suggested I scoot up for a better view. Interior: Last night, it was the predicable red-and-white-checker-tablecloth-with-melting-candles atmosphere. You couldn’t tell if you were in Italy, or in Little Italy. Tonight at Apostoli, I peeked inside. It was a former art gallery, they explained, and they chose to keep that decor intact in the cozy upstairs dining room. And, while my experience outside was perfect for a hazy late-April evening near the sea, I could imagine very happily lingering over a meal inside, too. Menu: Last night, it was a list of completely predictable standards. Tonight at Apostoli, the menu was thoughtful, intriguing, even educational…to borrow a trendy phrase, it felt curated. Things like pasta with anchovies and walnuts. (I didn’t have the guts to order that one, but now I wish I had.) I had the sense that these were all dishes I’d never heard of before, even though people here have no doubt been eating them for centuries. I couldn’t choose…and, I imagine, I couldn’t choose wrong. Food: For me, the most important part of any dining experience is the food itself. Last night, the pasta was actually quite good: noodles that were clearly handmade, with stewed tomatoes, melt-in-your-mouth roasted eggplant, and gooey mozzarella. But the “mixed salad” consisted of greens on the verge of wilting, flavorless tomatoes, and a few kernels of corn from a can. I sprinkled more and more salt and balsamico onto the salad trying to tease out some flavor. I failed. Oh, and there were about five tasteless olives. At one point the owner peered into my salad bowl and said, “You’d better eat those olives! I paid for them!” Finally, the desert (delizia di limone, a lemony sponge cake) tasted store-bought. Tonight at Apostoli, the salad was a revelation: ripe cherry tomatoes, shaved fennel, hand-torn basil, and — that extra-mile finishing touch that distinguishes a great chef from a merely competent one — a few little flecks of raw garlic to pull everything together and make the flavors pop. The pasta was hand-cut ziti with a sauce I’d never heard of, genovese neopolitana: slow-simmered onions and celery, giving each bite a savory, rich, caramelized sweetness. Decision: Apostoli, in a walk. You can guess which restaurant is going in the next edition of the Rick Steves’ Italy guidebook. What’s to be learned form this? First, if you care about food, expect more from your meals. Don’t settle for the same old trattoria on the same old piazza. Seek out that special place that dares to upend the clichés. A very fine line separates restaurants that deeply care about food from restaurants that care primarily about making money. Fine-tune your radar to detect that difference. And finally, don’t get stuck in the TripAdvisor rut. I find that restaurant ratings on TripAdvisor skew heavily toward crowd-pleasing tourist traps. Last night’s restaurant ranked in the mid-twenties on TripAdvisor; Apostoli is buried about 10 places lower. Based on my personal experience the last two nights, you can follow the herd — or you can challenge yourself to find something better. My dinner at Taverna degli Apostoli, in Amalfi, looked like an artistic tableau. And it tasted good, too. After a particularly grueling flight connection from Seattle to Sorrento, it’s great to be back in Europe. Getting here is a tedious chore of jet lag and culture shock. Around the time of my second layover (in Rome), I wondered — as I always do — whether this travel business is worth all the hassle after all. By the time I checked into by B&B in Sorrento, around 5 p.m., I was ready for it: my “Hey, I’m in Europe!” moment. I never know exactly when and how it’ll happen, but it always happens. It’s that instant where sleep deprivation gives way to euphoria, and you realize that, yes, being awake for 30 hours does have a payoff. On some trips, it takes a while. 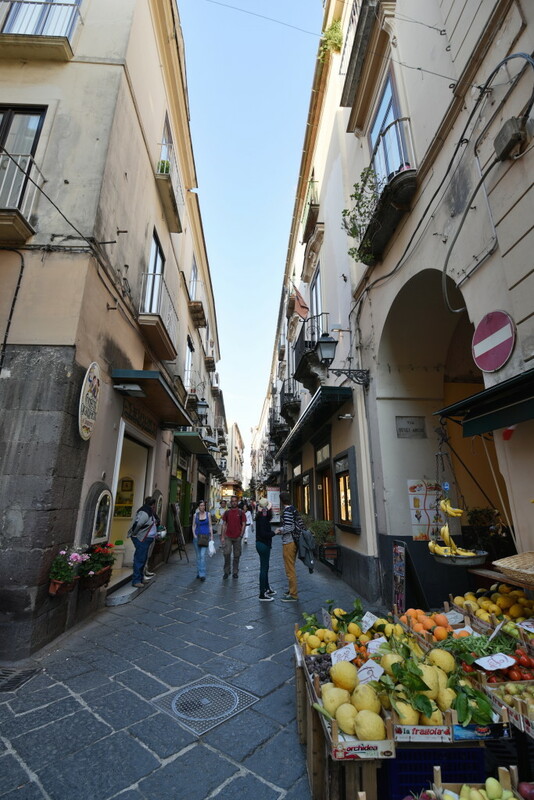 But this time in Sorrento, it was easy: Stepping out of my B&B, I was instantly plunged into the tight lanes of the old town. Piles of fresh-picked lemons the size of softballs filled the air with a blossomy aroma. Italians were out — promenading, licking gelato, convulsing with conversational gestures, and gently nudging motorinos between confused tourists on a “pedestrian-only” street. 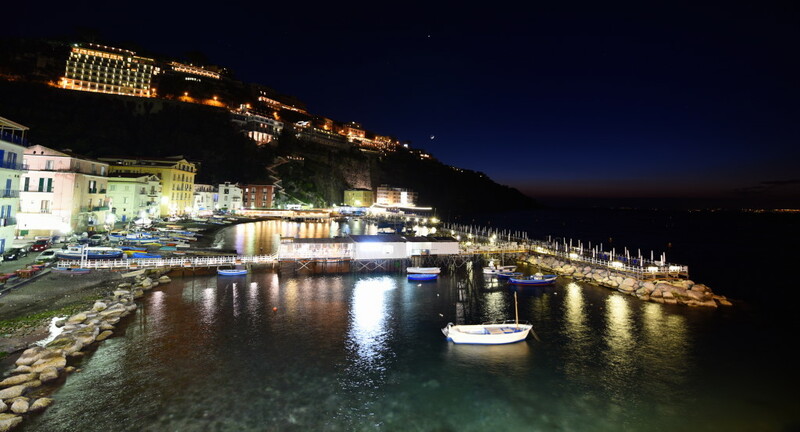 My second wind powered me down to Sorrento’s atmospheric old fishing village, Marina Grande, where I scored a prime waterfront seat at a fish restaurant. There I dug into an “everything but the net” seafood-bonanza risotto as I watched the sun’s last rays fall on Mount Vesuvius and the rooftops of Naples, across the bay. Hiking back up to my hotel (and a well-earned good night’s sleep), I snapped a twilight photo of one of the thousand scenes that keeps me enduring that jet lag, trip after trip. So, You’re Really a Travel Writer? It’s 11 a.m. in Sorrento. I just arrived yesterday from Seattle for a five-week guidebook-updating trip in Italy and France. I should head out soon to get to work. But first I’ll procrastinate by sharing this exchange I just had at the breakfast table, with a friendly twentysomething couple from New York. Over the next few weeks, I’ll have this same conversation many times. Like these people, you may be curious what it’s like to update and write guidebooks for a living. Like, you get paid to travel around and write about it? How do you get to be a travel writer? It’s a combination of hard work and luck. You have to love traveling and love writing, and do both things as much as possible. I was an English major in college, and got a job writing movie reviews for my hometown newspaper. But no matter how well you prepare, you still need a break at some point to get your foot in the door. 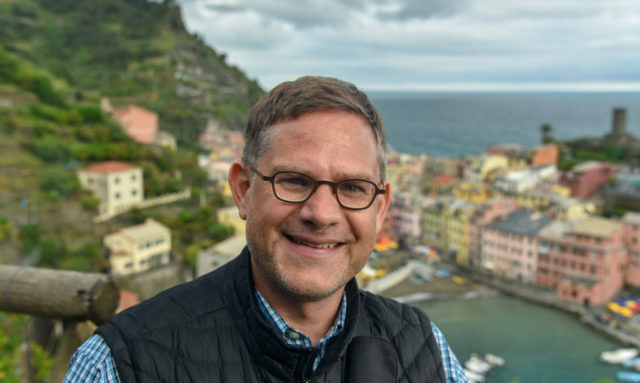 I started working at Rick Steves’ Travel Center, our retail store, and eventually got an opportunity to try updating some guidebook chapters. I worked hard, they liked what I did, and I got more and more work. You must love your job! What, don’t you love it? No, I absolutely love my work! But it is work…very hard work. My friends have, understandably, zero tolerance for me complaining about my job, and I totally get it — I get paid to travel around Europe, for Pete’s sake! But it’s not easy, and it’s not always fun. You may imagine “travel writing” is sitting at a café on a sun-dappled square, sipping a glass of wine or a cappuccino, and occasionally jotting down notes. But that’s not travel writing. That’s a vacation (with some light journaling). The reality is much more demanding, and often quite tedious. Basically, in every town I update, I personally visit each and every hotel, restaurant, museum, tourist office, laundromat, public toilet, train station, and so on, that’s listed in the book. That means lots of slogging around, having the same conversation a hundred times a day, figuring out ways to tease useful information out of a wide variety of people, and keeping very careful notes so I can write it up later…which usually happens after dinner, when I’m typing on my computer until 1 or 2 in the morning. The next day I get up and do it again…for five weeks in a row. It’s also physically demanding. When I updated the Rome book a year ago, my pedometer clocked 90 miles in seven days…all on foot. Wait, doesn’t Rick write and update those books? Yes and no. The series includes dozens of books, each of which is updated in person either every year or every other year. So there’s no way Rick could update all of them. That said, most people would be surprised (and impressed) by how involved Rick is in the books. He rotates which destinations he visits each year, so over time he sets foot in a major destination about every two or three years (at least), and in minor ones every four or five years. The rest of the time, it’s up to the other researchers, like me. How many people work on these books? Our office production team — editors, maps, and graphics — are about 14 people. (Our publisher, Avalon Travel Publishing, also has its own staff dedicated to Rick’s books.) There are about 20 people like me, who do research in Europe. There’s a lot of overlap — many of the editors also travel to update the books. That doesn’t sound like many researchers, given the number of books Rick has! We try to be very efficient with our time. Each chapter is budgeted the minimum amount of time we feel it’ll take to do a judicious update. And it’s a demanding job. If you ever run into any of our researchers in Europe, you’ll see that they’re constantly scrambling around. 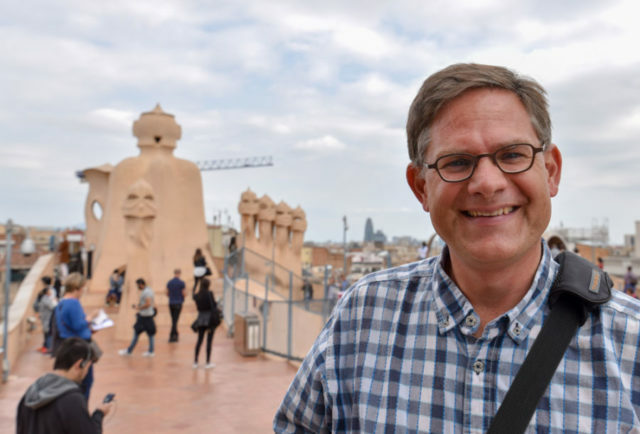 Fortunately, we have an outstanding team of researchers who understand our priorities and share a passion for travel — and for improving people’s trips. Do you ever read other guidebooks, like Lonely Planet, or check out TripAdvisor to see how the competition matches up? We don’t really view it as “competition.” What we do in our books is pretty specific; when I use Lonely Planet books, I’m struck by how different their focus is from ours. As for TripAdvisor, I do sometimes skim their reviews for hotels or tour companies, just to see if I’m missing something or to confirm my impressions. But I always corroborate anything I find there, independently and personally, before including it in our book. In short, I use TripAdvisor as one of many sources of information — but like anything, I take it with a grain of salt. Many travelers I meet tell me they check the TripAdvisor ratings in conjunction with our guidebook’s description, and I think that’s the smart approach. But I also meet a lot of people these days who design their itinerary based exclusively on TripAdvisor rankings…and these people seem to be having a less successful trip than people who have done more homework. The sad thing is, because review sites tend to be an echo chamber, you may never even realize what you’re missing out on. [lowering voice nervously] Wait, does this hotel know who you are? Yes. Usually the hotel I stay at knows what I’m up to. When I visit other businesses during the day, I can choose whether to identify myself or “go incognito.” If we’ve gotten bad feedback about a place, I’m more likely to pretend to be a clueless tourist — just to see how they treat me. But other times, the espionage isn’t worth the trouble. For example, at museums, I identify myself immediately to make it easier to quickly update the information. [noticing I’m getting a little antsy] It seems like you have a busy day ahead of you. Yeah, sorry — I’d really better be going, if I’m going to get to everything on my list today. See you tomorrow at breakfast!